Dhakka, Bangladesh -- WITH the current occurrence of religious intolerance and rise of fundamentalism, the publication of Buddhist Heritage of Bangladesh is a welcome relief. Once again, this anthology will focus on the cultural and religious heritage of Bangladesh. Bangladesh, being a melting pot of diverse culture and religions, has developed a tradition of showing reverence to all religions and culture. Bulbul Ahmed, one of our bright, young brand of archaeologists and historians, is the editor of this anthology. He and his colleagues have undertaken the much needed task of highlighting Bangladesh's contribution to achieving harmony and tolerance among different religious and cultural groups throughout its history. Buddhism has played a distinctive role in this regard. The book contains seventeen essays and innumerable images and drawings. Several historians, archaeologists and others have observed that Buddhism appeared in Bangladesh before the Common Era (CE), to be precise during the Mauryan Rule and accepted the presence of a Buddhist community in Bangladesh in about 2nd century BCE on the basis of Mahasthan Brahmi Inscription of c. 2nd century BCE. Of late this has been challenged (see Journal of Bengal Art, Vol. I, 1996, pp. 33-38).Though the issue is still being debated, the story of Buddhism in Bangladesh can be safely narrated on the basis of various sources including archaeological findings. This is what this anthology has done. No story of a religion can be completed without dwelling upon its proponent. The proponent of Buddhism was a Prince of Nepal turned into a Savior of Mankind. His principal concern was to save mankind from worldly sufferings and miseries. At the time of his enlightenment, he was only 35 years old. For the next 45 years he preached his beliefs throughout the larger part of India. But his visit to Bangladesh, very close to his seat of activities cannot be confirmed by any yardstick of historical justification. Buddhism and Buddhist community flourished in Bangladesh certainly from the time of Emperor Asoka (BCE 268-231). From the time of the Gupta Empire (320-550 CE), Buddhism took deep root in Bangladesh, and Buddhist communities increased tremendously in large areas of northern, southern and middle Bangladesh. But the glorious days of Buddhism began with the foundation of the Pala rule in Bangladesh. Gopala the founder of this dynasty was a Buddhist and after gaining power he 'created a new social order based on justice and equality among all people'. He established numbers of Buddhist Viharas or monasteries all over the country, and these Viharas soon became the centers not only of Buddhist learning but also of great academic and intellectual persuasion. D. P. Barua, in the introductory pages dwelt critically on the rise and expansion of Buddhist religion, culture and civilization in Bangladesh. Rudra Prosad Samaddar in his essay written on the inscriptional records drew a picture of the country's educational, social and cultural life. One of the most significant aspects of Buddhist Bangladesh was the patronage of the Emperors, Kings and devotees of the educational institutions and scholars. Other inscriptions discovered so far also reveal the names of famous Buddhist teachers and sects. They also refer that Kings professing different faiths also donated lands for Buddhist Viharas and temples. Likewise the Buddhist Kings also made land grants for Hindu temples. These examples 'indicate the existence of a peaceful multi-religious society in ancient Bangladesh'. A large number of Seals and Sealings have been discovered from various sites like Paharpur Mahavihara and Salban Vihara in Comilla. These seals and sealings throw light on many things like the names of Vihara and their founders as well as on the social and economic life of the country. Jibanananda Basu dwelling upon the subject observes that seals and sealings made of terracotta, stone, copper and bronze reflect the artistic skill and religious characters. Hiuen Tsang, the first Chinese pilgrim to visit the kingdom of Pundravardhana around 638 CE remarked that there were about 20 Samggharamas or monasteries with some 2000 monks in Pundravardhana. Bulbul Ahmed and Md. Asaduzzaman did not accept Hiuen Tsang's claim that Shashanka, King of Gaur (c. 590-625 AD) (North West Bengal), was involved in anti-Buddhist activities. However, they agreed that the accounts of Hiuen Tsang and other Chinese pilgrims like Sengchi, I-tsing throw much light on Buddhist Bangladesh and affirm that Pundravardhana and Samatata (South East Bengal) were major Buddhist centers of ancient world. Perhaps the most informative chapter of the book is the Ancient Sites and Settlements contributed by Bulbul Ahmed et al. This chapter gives a graphic account of the major settlements of the Buddhist community in Bangladesh. Buddhism also led to the flourishing of the artistic genius of the people. In Bangladesh as elsewhere, it gave rise to a unique style of architecture in the form of Stupas, Shrines and Viharas. These monuments and structures not only mark them as distinct forms of architecture but they also show the skill of the contemporaries in designing and planning the monuments. Moreover, some of the features of these structures depict the contemporary life and society. Viharas were basically built as residences for the Buddhist monks. However, the architectural style and designs were breathtaking. Bulbul Ahmed and architect Shameem Aminur Rahman have given an outstanding account of the Buddhist architectural features in Bangladesh. Terracotta ornamentation is the most significant artistic expression of human societies. The dynamic representation of this art is found mainly in South Asia, especially in Bangladesh. It was mainly used for the outer decoration of the Buddhist shrines during the 7th- 12th centuries CE. A detailed and graphic account of the terracotta work has been given by Mohammed Shohrab Uddin and Sharmin Rezwana. Md. Mosharraf Hossain and Swapan Kumar Biswas have provided an excellent account of Buddhist Sculptural pieces that have been so far found in Bangladesh. Buddhism in Bangladesh is also associated and reflected in religious symbols like Bells and Coins. Bells as Sabikun Naher and Pranab K. Chattopadhyay in their essay observe, 'hold an honored place in various religious ceremonies of the Buddhist pantheon'. Coins with symbols have been discovered in great numbers in Bangladesh. Poems and songs are important cultural offshoots of Buddhism. In fact, the composition of the earliest poems which are collectively described as the Charyapadas led to the emergence of Bengali language and literature. The other art form which is an offshoot of Buddhism in Bangladesh is the 'Manuscript painting'. 'The earliest specimens of painting', observe Niru Shamsun Nahar and Mohammad Abu Al Hasan, 'So far discovered in Bangladesh are the religious miniatures on the Buddhist manuscript'. The more charming offshoot of the rise and evolution of Buddhism in Bangladesh is the drama. Dramatic performance is associated with Buddhist religion. Saymon Zakaria observes that Buddhist drama mainly dealt with the life and theological ideology of Gautama Buddha, and the way to achieve nirvana …through music, dance and acting'. 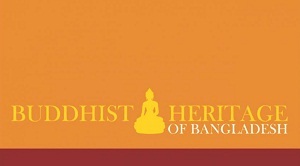 Buddhism in Bangladesh has also produced eminent personalities and scholars. Bandana Mukhopadhyay highlights such great scholars as Silabhadra (c. 584-654) and Chandragomin (c. 7th century CE). Sufi Mustafizur Rahman highlights the recent excavations which have unearthed evidence that support the existence Buddhism and Buddhist culture in Bangladesh in remote past. Enamul Haque attempts 'perhaps for the first time, to see together aspects of Buddhist art and architecture as have been revealed at Nalanda, Paharpur and Mainamati'. He also remarked that he finds the growth and development of Mainamati site of Bangladesh, as a parallel to Nalanda! Overall, the book is a timely and refreshing addition to the world of heritage studies. Moreover, it will provide to the general readers the true ideals of Buddhism. As Bandana Mukhopadhyay rightly observes, 'Buddha also taught that we cannot be happy as long as others suffer, and that when we do reach out, we discover the best in ourselves. The universal message of peace, love, good will, tolerance and compassion preached by Buddha more than 2600 years ago had never been more relevant than today'. The reviewer is Chairman, Department of History and Philosophy, North South University.